Ever wonder what it takes to enjoy swinging through high-rises and slashing through ruins? There are games that let us fulfill our fantasies of pointing off into the distant horizon and follow our curiosity. They let us traverse, on and off the beaten track, to discover what lies just beyond our vision. Games like Skyrim or Breath of the Wild place towering mountains and monolithic structures within the gamer-explorer’s grasp and give us amazing tools to reach them, like sure-footed steeds or sweeping hang gliders. 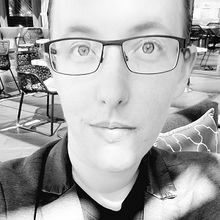 In a fantasy world, what you can find in a game is limited only by the developers’ imagination and the technology they use to execute their designs. The challenge to create awe-inspiring sandboxes is infinitely increased, however, when those spaces of play are rooted in reality. Nonetheless, games like Spider-Man and Assassin’s Creed Odyssey take up the challenge. This year at GDC, both Insomniac and Ubisoft held talks detailing exactly what they faced in recreating real life for our sandboxes. Insomniac wanted Spider-Man’s world to be hyper-realistic, but also retain that Marvel superhero sheen. The game already required some suspension of disbelief -- your main mode of transportation through the city is web-slinging -- but keeping the world believable was a major focus. One problem with this for Spider-Man came when designing the city at night. Senior lighting artist Brian Mullen described New York at night as obviously dark but having a vibrant nightlife. Also, as anyone who has played Spider-Man will know, there are a lot of collectibles. The backpacks were especially difficult for the night-time designers because Peter Parker had hidden them all over the city and not always in the most well-lit of spaces. The Spider-Man team faced the problem of needing to have darkness, visibility, and vibrancy all at the same time. So, as Mullen explained, night in the game, “departed the most from reality” as he and his team played around with slightly unrealistic lighting solutions that didn’t break player immersion. Lighting assists in the overall storytelling in a subtle but vital way. The best lighting in a game enhances the players’ experience, without calling attention to itself. 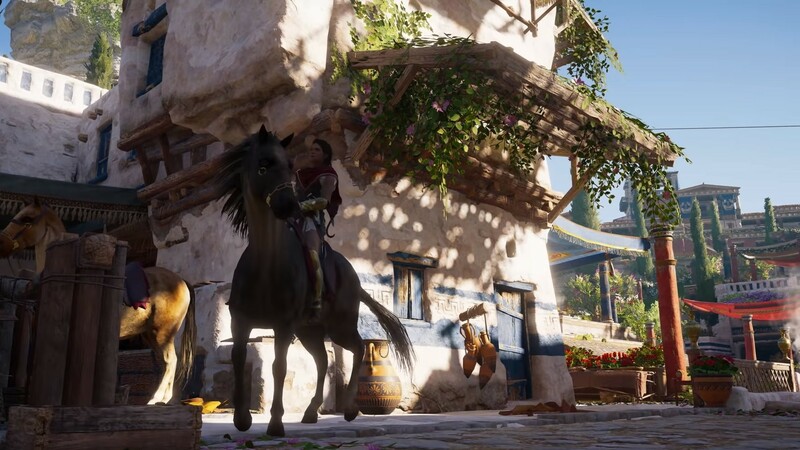 Despite the thankless nature of the job, lighting artist on both Assassin’s Creed Odyssey and Spider-Man contributed monumentally to crafting a believable sandbox. To give every neighborhood its own feel in Spider-Man, they gave each one its own palette. Hell’s Kitchen’s street lights tended towards the warmer shades while the Financial District had LED-lit streets. To make life-like lighting conditions, the Spider-Man creators went out with an SLR camera to take pictures in both lighted and shaded areas, to get a base-line for the game. The disparity turned out to be too stark, making the light from the in-game sky appear blindingly white if the player were standing in a deeply shaded alley. One of the most beautiful aspects of Spider-Man’s sandbox is the way that the light plays across the surface of the buildings. Mullen explained how the team created those effects by splitting the lighting into four different locked types: day, sunset, overcast, and night. The hardest by far, he asserted, was overcast. When everything is grey and bleak, it is less inspiring for both creators and players. He combated this by turning up the lighting contrast and shifting everything towards a greener tone. That way, he could still support the more somber story beats while highlighting the developers’ work on the city. His favorite time was sunset and the golden hour. During this time, as Mullen put it, warm and cool colors create a visually interesting mix and the designers were able to play around with those spectacular god rays. The only problem? This type of light is the most prone to showing off little mistakes, sometimes from buildings blocks and blocks away, making it hard to find the source of the problem and fix it. Assassin’s Creed Odyssey had a somewhat different lighting challenge. While the team paid consideration to how natural sunlight in the game works in tandem with the various structures players could interact with, you can imagine they were more concerned with how the player would see in the ancient world at all. The only light source of the time being fire, game makers had to decide how the players would traverse dark areas, like the caves predominantly built by level designers to give players fun explorable spaces with important collectibles throughout the world. 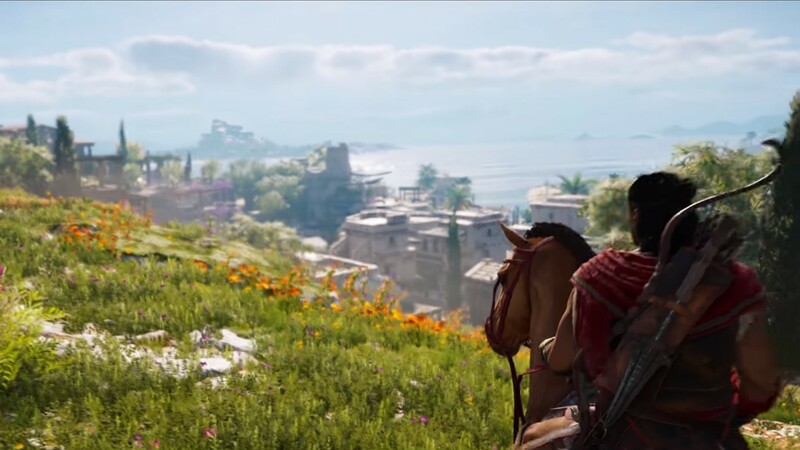 Ubisoft also wanted to deviate from other popular depictions of ancient Greece as being de-saturated, monochromatic, and flat, so vibrancy was key. Ubisoft went all-out to faithfully recreate the ancient Greek world. They decided a group trip to Greece was essential to their creative vision. If only I’d thought to convince someone that writing this article absolutely hinged on a week-long trip to Greece. However, when the Ubisoft team made their trip, they took over 13,000 pictures to use as a reference for their urban hubs and the seven unique biomes they would create for the game. Though the fact that many buildings they wanted to recreate had long turned to dust -- temples and structures made of wood, for example -- it actually turned out to be an unexpected gift. With no pre-formed picture to emulate, the developers could bring in a little of their own flair. Much to the team's delighted surprise, most of the art for the ancient Greek world was vibrantly painted. This encouraged them to create pops of color in a world often depicted as having only stark white marble. While they both had vastly different time periods to cover, Assassin’s Creed Odyssey and Spider-Man developers each admitted to sharing one tool: Google Earth. The street view function allowed Ubisoft to study ancient Greek ruins and the Insomniac team to explore New York City anytime they wanted. 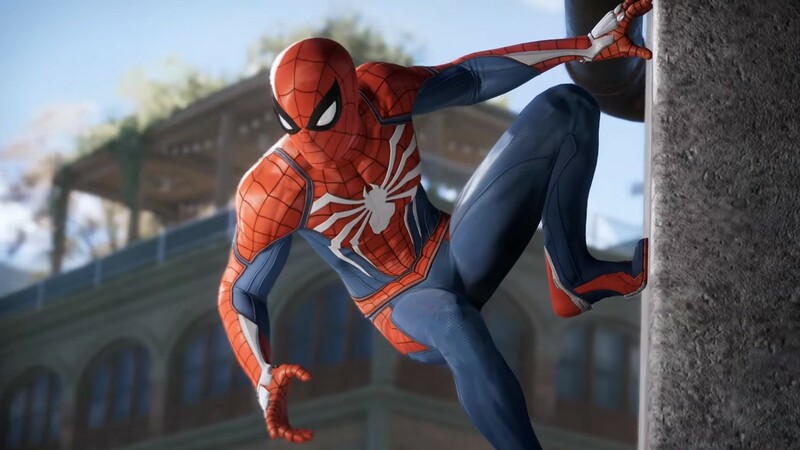 The Spider-Man developers knew they wanted to reflect the variety of different cultures found in NYC in their game and that portraying the neighborhoods accurately would be important to telling the story of the world. To do this, the city was broken down into districts, which in turn were broken down into smaller neighborhoods. This allowed them to create micro-stories artistically for each place. The art direction was set for each neighborhood and then the districts further refined their own personalities, though staying true to the larger neighborhood’s aesthetic. 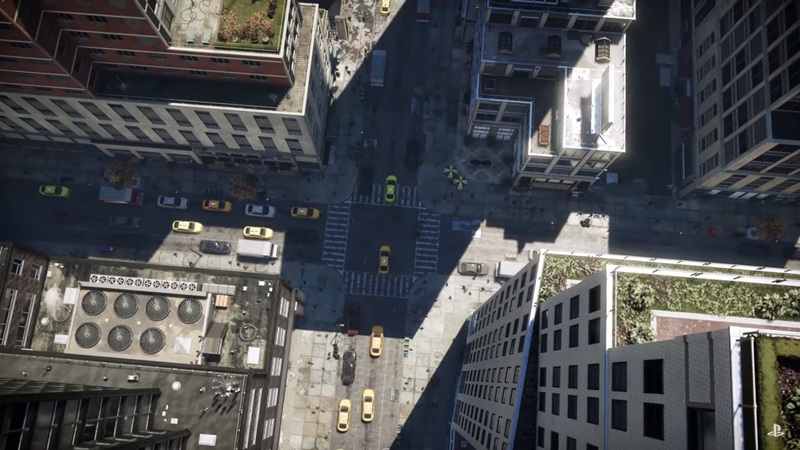 The most frequently used textures for Spider-Man were, unsurprisingly, roads, sidewalks, and rooftops. But since each neighborhood had its own feel, the textures would eventually meet at a shared border. During their initial development, those converging zones just look like a wild clashing of different and jarring aesthetics. To solve this problem, the developers decided to create a shared layer of asphalt underneath each neighborhood’s unique formula that would increasingly show through as they reached one of these shared borders, creating a satisfyingly homologous look without sacrificing each spaces individuality. I admit that when I went into this talk, I didn’t care about tiny details like how Insomniac blended together asphalt textures or how Assassin’s Creed Odyssey’s caves were built, but during the talks, both teams put the question to us: why is it important to get these minor details? Why not just place generic buildings and call it good? Insomniac’s senior environment artist answered the question in the first few minutes. He insisted it was because these uniquely crafted spaces created a sandbox that rang true to real life, engaging the player in a way that a generic New York skyscraper simply wouldn’t have been able to. 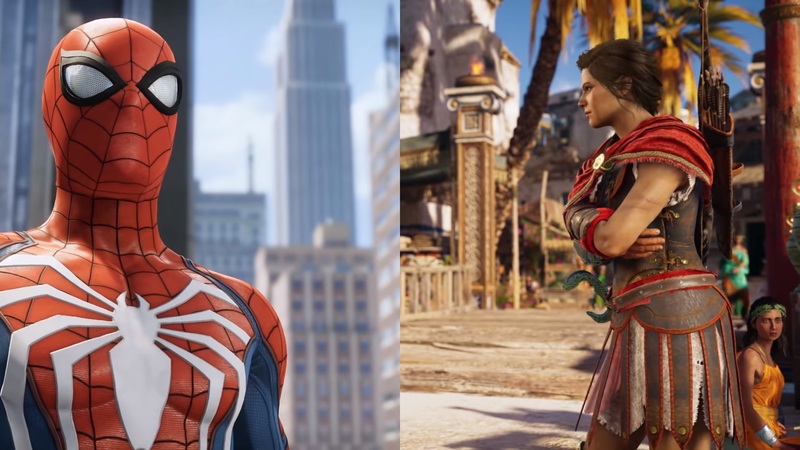 The key to translating the real world, from Assassin’s Creed Odyssey’s ancient streets to Spider-Man’s modern Manhattan, into a sandbox is all in the details.